Sister and I usually exchange money and a small gift for Christmas. It’s just what we do and we both love it. This year I gave her a passport cover to put the money in (prior to our CA and AK trip) but then came across the CUTEST clear clutch to use as a stadium bag. So the money and passport cover all went in that. It was literally the last minute, so I had the bag sent directly to Savannah. I promised her a monogram for it but she hasn’t picked out a style. 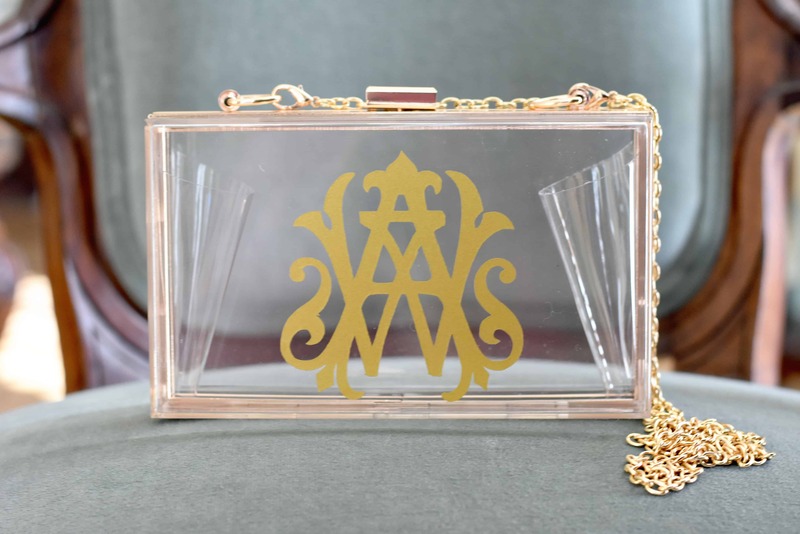 Meanwhile, I did monogram my own (I had to have one too!) and am so excited to share. I used my custom monogram and gold vinyl, cut on my Cricut. It took about 2 minutes flat and I cannot wait to use this! I have the Cricut Explore Air 2 and really like it. Once upon a time I had the first iteration of a Silhouette and they have come so far since then. I use Siser permanant adhesive vinyl. I love this so much! Our Disney/Universe vacay was perfect you for landed for us this dally by the way! We had such a great time as a family! I love this stadium bag so much! Our Disney/Universal vacay you planned for us this past fall was perfect by the way! We had such a great time as a family! I translated it just fine :-) So happy you had a great trip!! Love this cute bag! Interested as to what passport cover you purchased and where? Trust your judgement. THIS BAG!!!!!! !☺ It’s too adorable! Oh gosh, how fun!!! That sounds just like mine!! Where did the monogram design come from. Mine is from Number Four Eleven in savannah. However, that was before they were easy to get on etsy! Look up ShulerStudio. They have beautiful styles.